Everyone’s heard of wanting to take home your wisdom teeth after they’ve been yanked from your mouth, but an entire leg? Earlier this month, my colleague John McDermott had many questions about a man who served his friends tacos made from the flesh of his own amputated leg, one of which included, how did the man convince the hospital to give him his foot back in the first place? According to an interview with the man conducted by VICE, all he had to do was ask for it. “When a car hit his bike and sent him careening into a nearby forest, his foot was shattered to the point that he would never walk on it again. When the doctor asked if he wanted to amputate, his one question was, ‘Can I keep it?’” VICE reported. As it turns out, he wasn’t even the only one: In 2011, Kristi Loyall, a woman who had been diagnosed with cancer of the leg, opted to have her foot removed, and she too requested to take home her severed limb. “He thought I was joking, and I was like, ‘No, I really want it back,’” the 25-year-old told NewsHour. So, to take home your severed limbs or ruptured appendix, is it really as easy as asking for it? David Goldberg, reporting for Slate, notes that some hospitals may forbid giving back removed body parts, but that there’s nothing in the Joint Commission on Accreditation of Healthcare Organizations that regulates wanting to take home a piece of your body. To that end, according to the same NewsHour article, there are no federal laws that prevent a person from owning body parts, unless said body parts are Native American. “The Native American Graves Protection and Repatriation Act makes it illegal to own or trade in Native American remains,” it reports. And while a few states (Louisiana, Georgia and Missouri) restrict owning and selling body parts for the most part, as long as you’re the owner of that severed leg, arm, finger or ear, it’s yours to take home and do with it what you will. That said, Allen Kamrava, a board-certified colon and rectal surgeon at Cedars-Sinai Medical Center, told Hopes and Fears that in most cases, organs are sent to the pathology lab to be analyzed. “Even bullets in trauma situations, the cops will always ask us to give them the bullet, but hospital policy, at least where I did trauma surgery, was that it had to go through the pathology lab first. Then the police could retrieve it there,” Kamrava told the website. 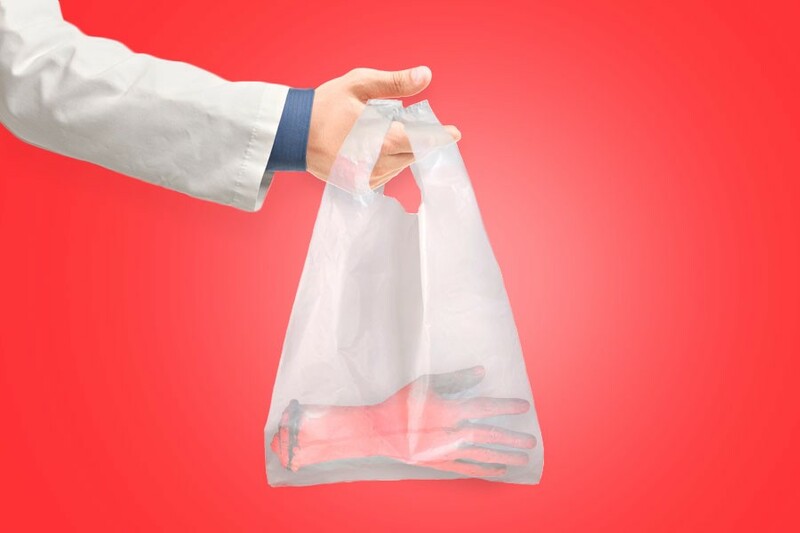 That could explain why Cedars-Sinai was unable to offer much insight into their policies surrounding to-go bags for body parts. “Thank you for reaching out to Cedars-Sinai for your media request. I’m afraid we’re unable to help you with this one,” Diane Wedner, a senior communication specialist at Cedars-Sinai responded to my email on the same topic. But now you know that it is in fact permitted, and that taking home a piece of yourself is your right. So if you ever end up needing to say goodbye to a piece of your body, just know that, should you want to, you can say, “see ya later,” instead.